Velkin Nikolay (General Director PromGrazdanProekt), Hans-Jürgen Vetter (CEO WST Tragwerke GmbH), Neumoin Alexandr (Contracts Manager). 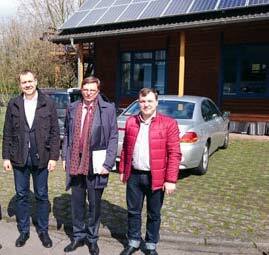 Visit to the HTS-production unit of Steier Holzbau GmbH by PromGrazdanProekt/Moscow. PromGrazdanProekt is a renowned roofing company from Moscow specializing in flat roofs. The company has 350 employees and plans to expand its business as a supplier of flat roofs for both industrial and commercial buildings, as well as renovations. PromGrazdanProekt is interested in a WST partnership for HTS hybrid beams for Russia.